Based on the ideas of Socrates in this form of dialogue, conversation is used to find the value and truth of people’s opinions. A facilitator directs group members to think about the answer to some universal problem. They then work together to arrive at a common consensus through ‘argumentation’. Focussing on concrete examples from their own experience, they are questioned on their assumptions and principles. Socratic Dialogue stresses the importance of thinking about thinking. Policy Dialogue is often used to describe people from different interest groups sitting round a table to focus on issues where they have a mutual, but not necessarily common, interest. It assumes that people in different positions will have different perspectives on the same problem. Groups are usually by invitation only and are small, well-structured and with a focussed selection of issues chosen in advance. Most importantly, Policy Dialogues end with a set of commitments to action for all participants. This form is often used in the development of public policy. The objective is not so much to talk together but to think together to identify the best course of action. Thinking together involves listening deeply, exploring new ideas, searching for points of agreement and bring unexamined assumptions into the light. It usually revolves around a question that needs to be addressed rather than a problem that can be efficiently resolved. The question usually takes the form “What should we do?”. Inter-group dialogue, based on the philosophy of the democratic and popular education movements, is a face to face, facilitated conversation between members of two social identity groups or ‘tribes’. It is most commonly used in education and religion and integrates the goals of consciousness-raising; building relationships across differences and strengthening capacity to promote social justice. Open Dialogue is both an approach to people experiencing a mental health crisis (together with their families) and a system of care developed in Western Lapland in Finland in the 1980’s. Open Dialogue teams work to help those involved in a crisis situation to be together and engage in dialogue. This part of Finland is now thought to have best documented mental health outcomes in the Western World. The Toolbox approach consists of Dialogue with a set of questions and statements in a workshop environment. It is often used in a research environment to reveal the underlying assumptions of researchers from different backgrounds by asking simple questions, for example, ‘what kinds of data constitute scientific evidence?’. Making assumptions explicit enables deep mutual understanding and the development of shared standards. My research for the Dialogue Community of Practice is primarily about the application and impact of ‘Generative’ or ‘Bohmian Dialogue’. ‘Generative’ because it collectively generates new ideas and meanings. The word ‘Dialogue’ is derived from the Greek ‘dia’ (through) and ‘logos’ (the word) and suggests ‘meaning flowing through’. David Bohm (2004) On Dialogue. Psychology Press. William Isaacs (1999) Dialogue and the Art of Thinking Together. Doubleday. Previous Entry The Silent Launch – First Speaker Announced! Thanks for this… good to see the diffferent ‘takes’ on dialogue alongside one another. I see dialogue as a form of collective inquiry, driven by good questions and well-designed spaces for dialogue. 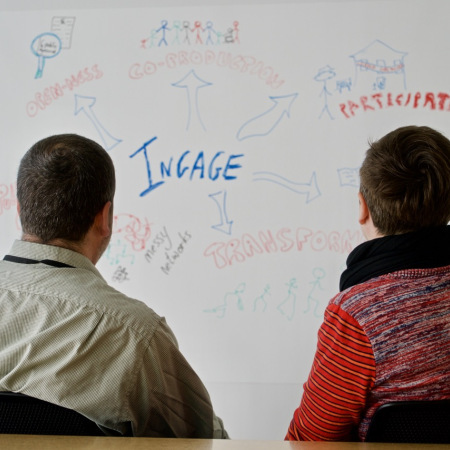 It is part of a broader ‘place-making’ process that meshes dialogue space design and inter-personal meaning-making (noticing shared meaning, and agreeing approaches to address disagreements) and framing action – acting on the fruits of the dialogue. I have recently been interested in the ‘4 types of conversation’ multi-stakeholder partnerships model… http://www.mspguide.org/tool/4-types-conversations – I like the structuring and sequencing, moving through different forms of dialogue. There is also an interesting distinction between reflective dialogue and generative dialogue.